This Eterna came all the way from Norway, and it needs a fair amount of attention! 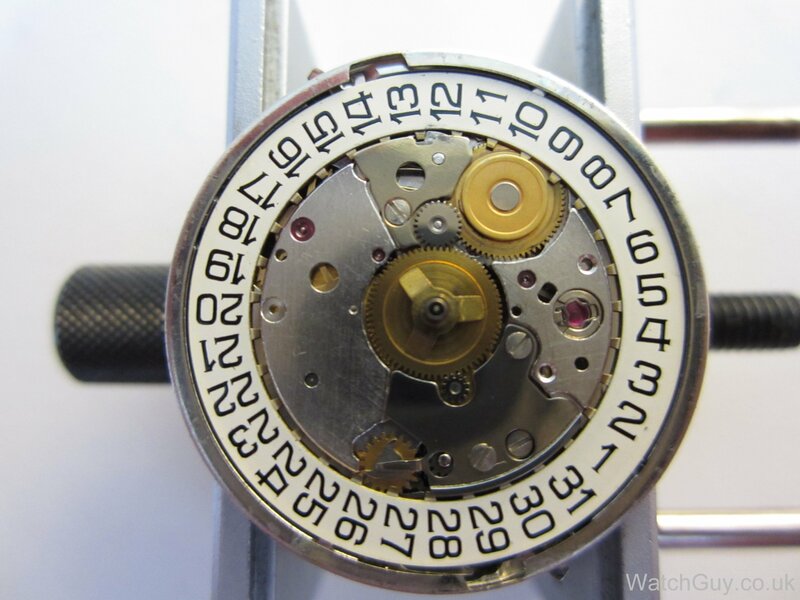 The calibre 12824 is pretty much an ETA2824. It’s not working, so let’s see what’s up! 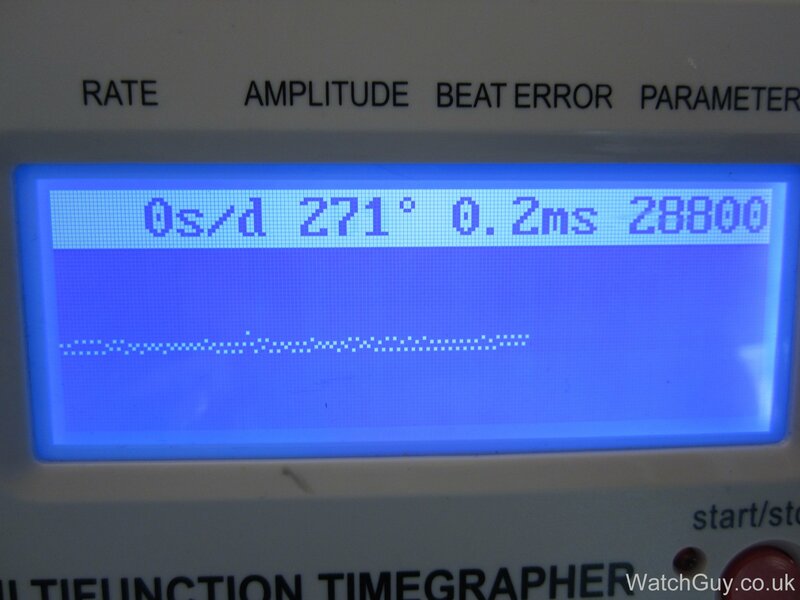 Yes, that looks very much like an ETA2824. Very snappy date change, and a lovely 28,800 bph movement. 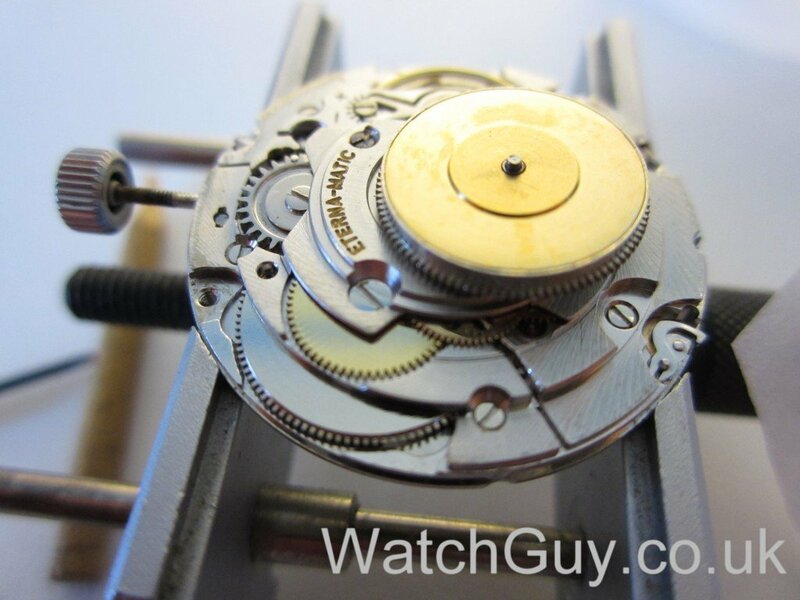 With the auto winder taken off, the movement starts beating. If you look closely at the barrel wheel (it’s not a click wheel, as the click is on the crown wheel), you can see missing and damaged teeth. The gear train. When I remove the barrel, I notice that the lid isn’t on. Starting on the bottom plate. And everything is ready for the cleaning machine. 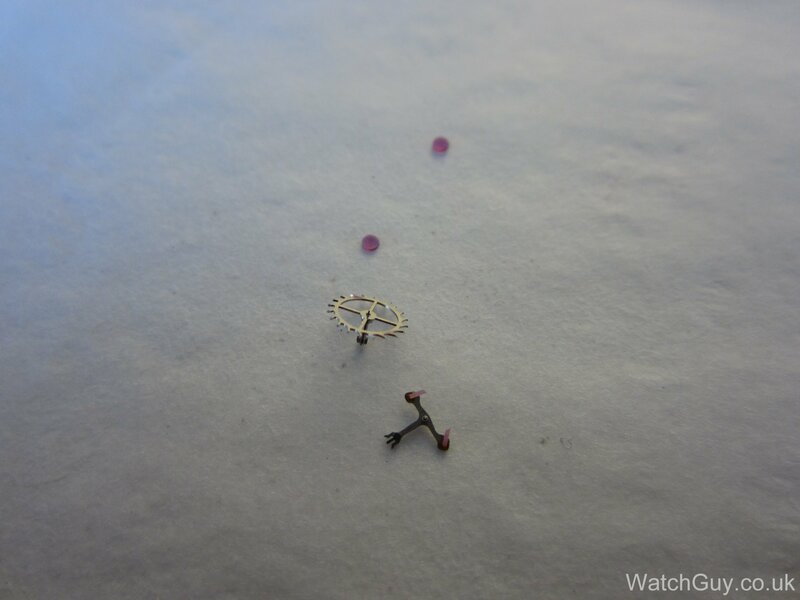 Escape wheel, pallet fork and cap jewels after the epilame treatment. Old and new barrel wheel. As the old barrel (on top of the movement) kept opening up (so there was a reason why the lid was off when I took the movement apart), I got hold of a used barrel from an ETA2824. 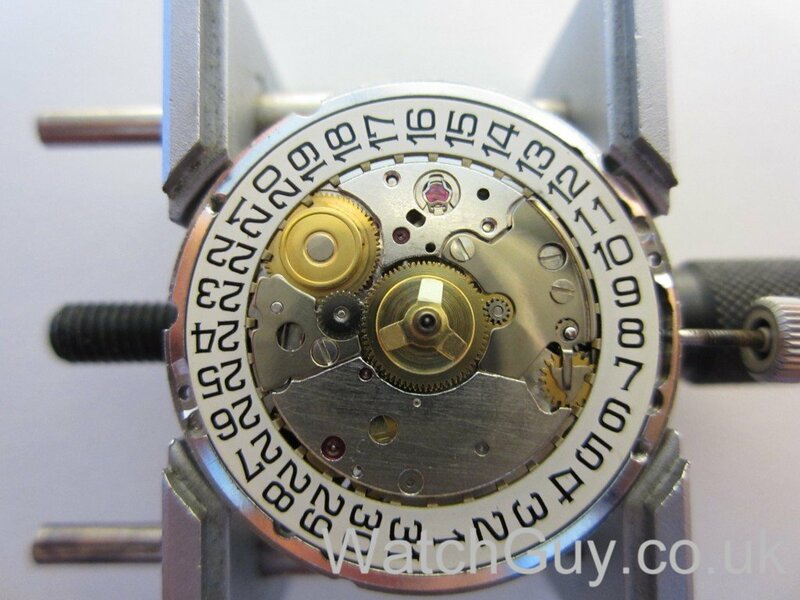 Ready for the dial and hands. The dial is in great shape, and so are the hands. The movement goes back into its case. And the back gets a new gasket. And that looks even better! Great watch. 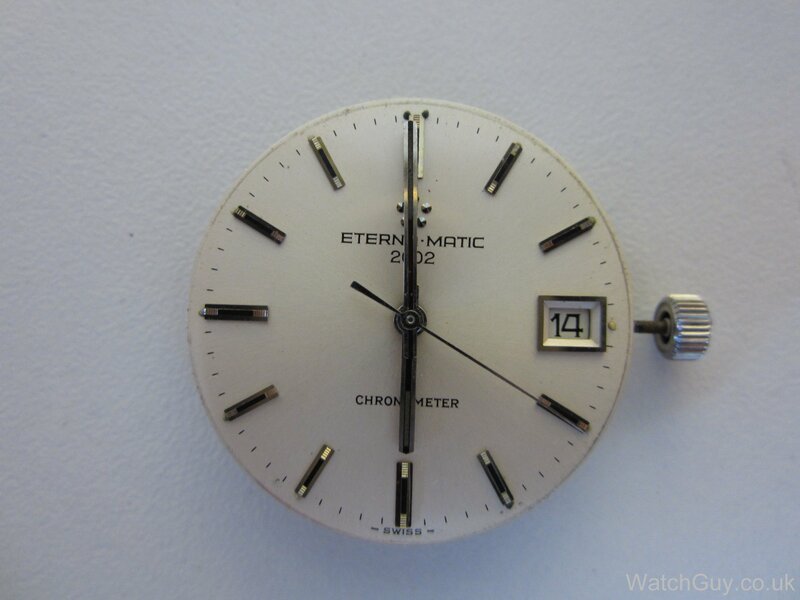 Hi Christian- I just recently acquired ( Aug-2016) a most beautiful late60′ /70’s Eterna Chronometer ( Exqusite design in Jet Black & gold- engraved leaves battens-a presentation watch to a fire Officer Venezeula ) I think it is 1441 movement with a quick- click date change,& usual cyclops eye.The wider & its clicker have come loose..so I guess this has not been serviced for quite a while.could you/ would you take this job on ?! Many Thanks & Kind Regards..Eric. 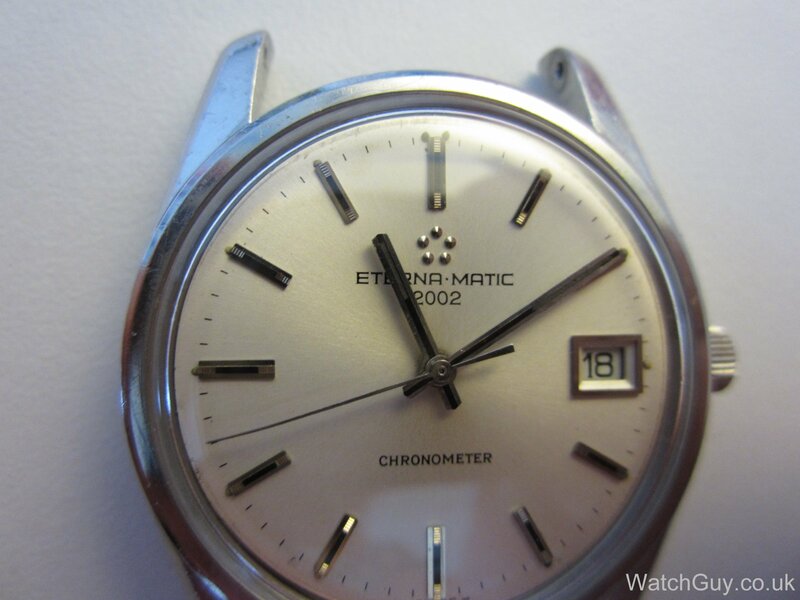 I have a 1960’s eternamatic ladies watch which alas looses time. Could you tell me where in England I could find someone reliable to fix it and service it. I have the same one . Myfather use to work at alcan in québec. 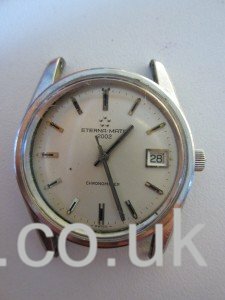 What is the value of this watch ? Thank you. Sorry, I don’t provide valuations. 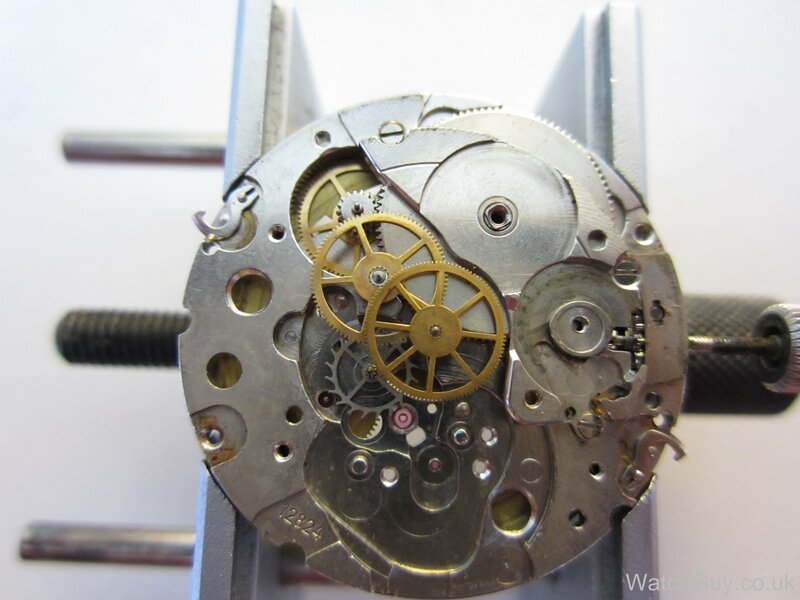 I have a watch with the very similar movement, 12824 is stamped next to the balance, but the auto winding bridge is not jeweled, as expected for cal. 12824. 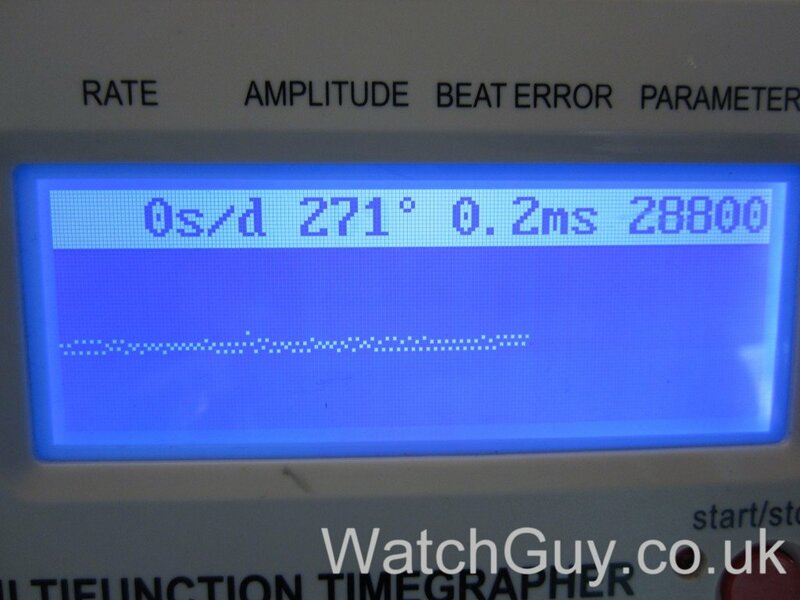 In other words it has only 17j, not 25j as other 12824 I have seen. Does your watch have the jeweled winding bridge or not? I looked carefully at your pictures, seems it possibly does not. Also my has 044 stamped on the plate, which looks like the internal manufacturing code. Does your movement have that? 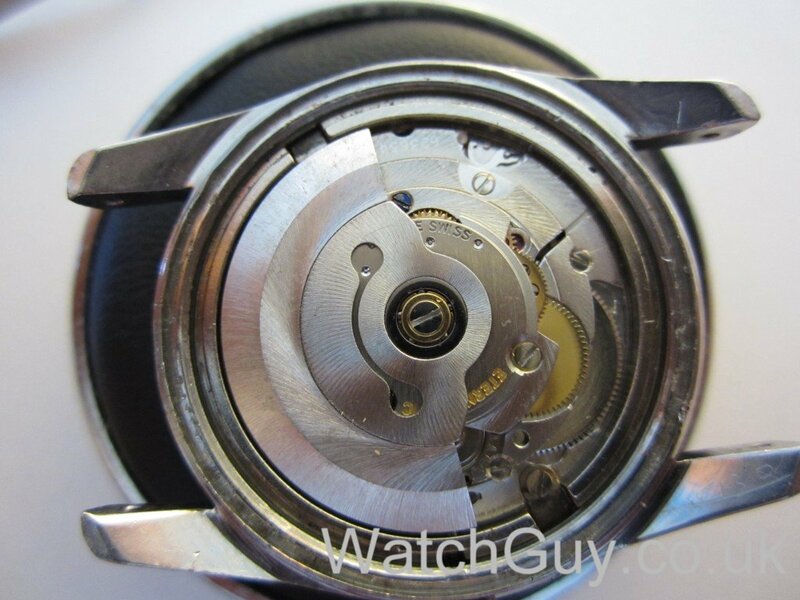 I’m afraid this is not my watch – most watches shown on the blog are customer’s watches. 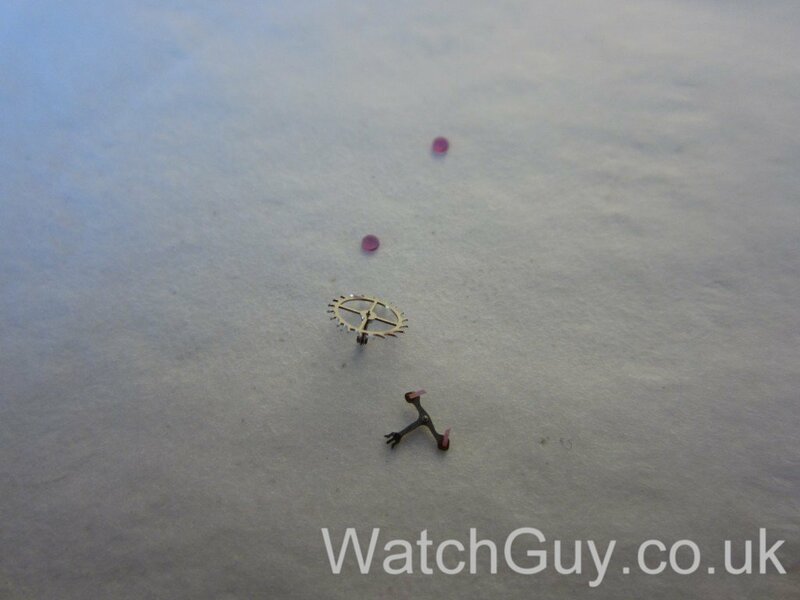 I’m sure there are different versions with different jewel counts, and there is no doubt for me about the authenticity of this movement. Christian, thanks for your quick feedback. But how many jewels does it have, 17 or 25? I don’t have the watch here any more, and I don’t remember I am afraid. I love an Eternamatic, and that is a particularly fine example of the breed! Could you tell what was making the barrel insecure? 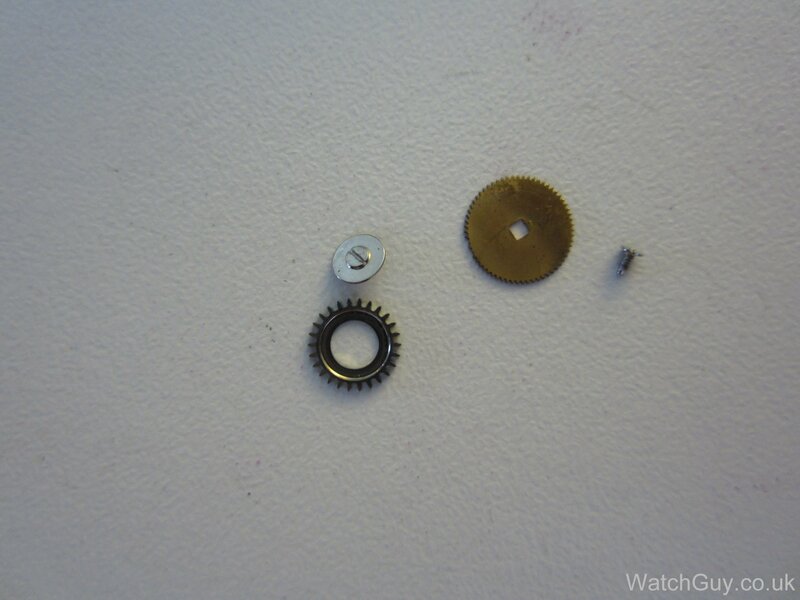 There just wasn’t enough tension, and every time I put it back together, it popped open when winding. With the replacement barrel, that stopped and it now works well. I read somewhere that the ETA 2824 is an Eterna movement, as development of this ebauche was carried out by Eterna in the 1960’s. 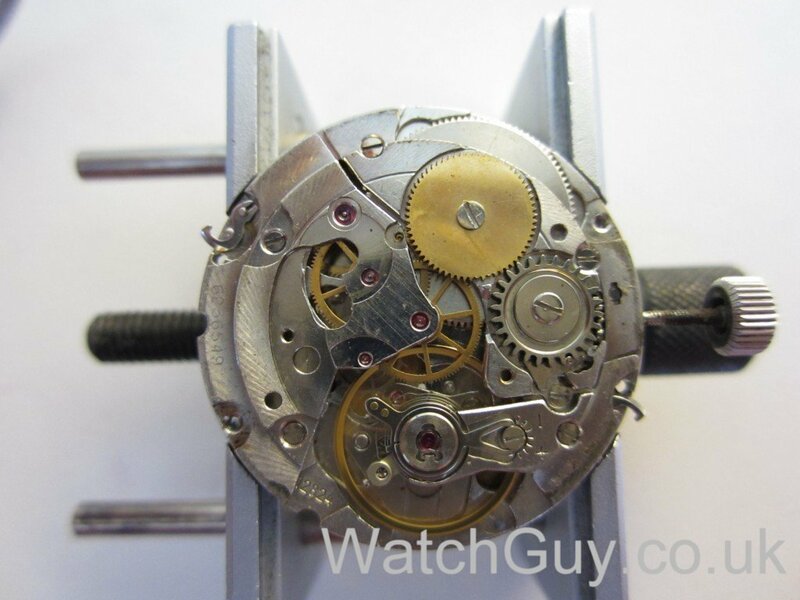 Was this watch originally sold as a certified chronometer? 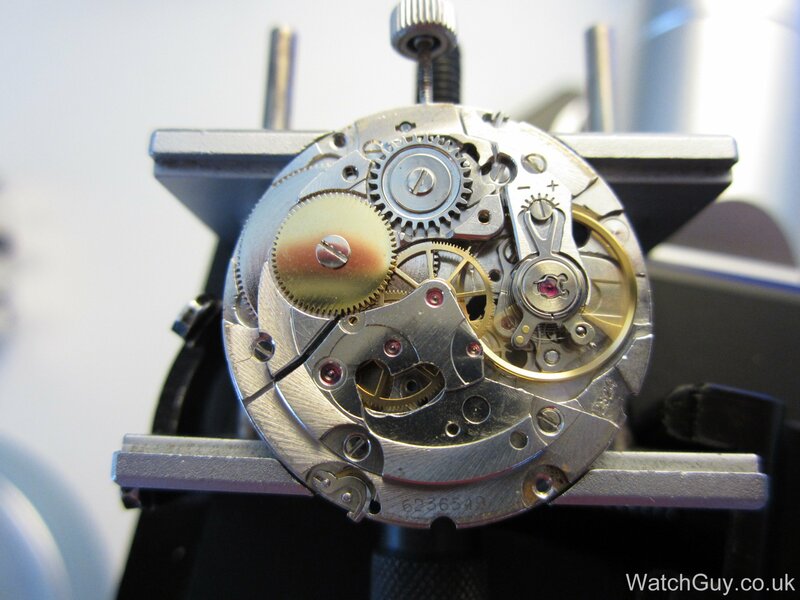 ETA was separated from Eterna back in the days since Swiss law blocked the manufacture of own, complete watches, together with ebauches. 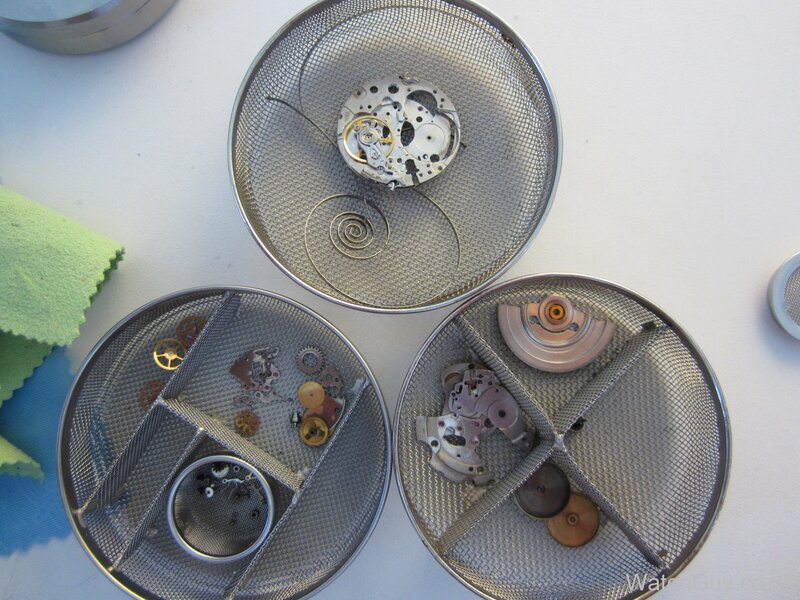 Due to the close connection, very often back in the 50s and 60s Eterna would develop new movements, and later transfer these to ETA for sale to others. Both ETA 2824 and 2892 are famous examples of this. 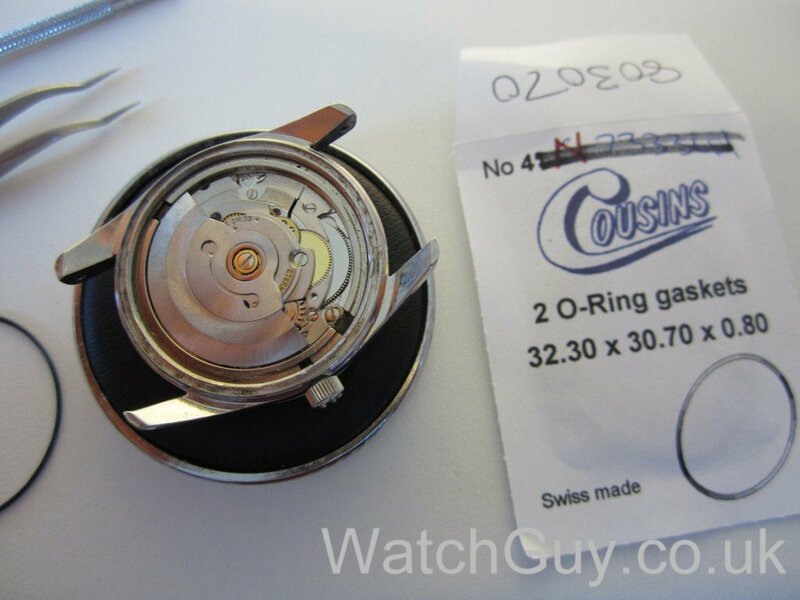 The watch here was sold to the large Canadian company ALCAN. They presented the watches to employees, normally after 25 years in service. It seems that higher ranking / management guys got the Chronometer versions:-) I have the original boxes from the first owner. 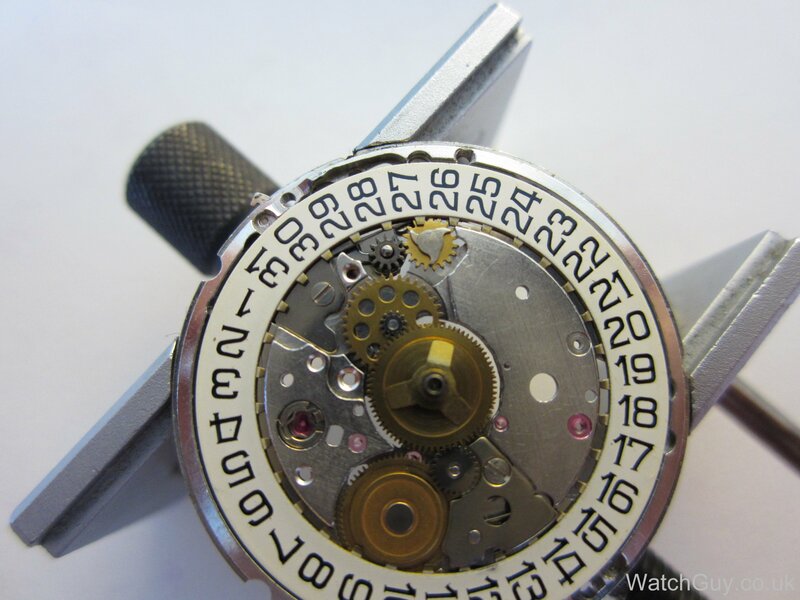 The caseback has the ALCAN logo cast (not engraved) in addition the name of this person and year the watch was presented is engraved. 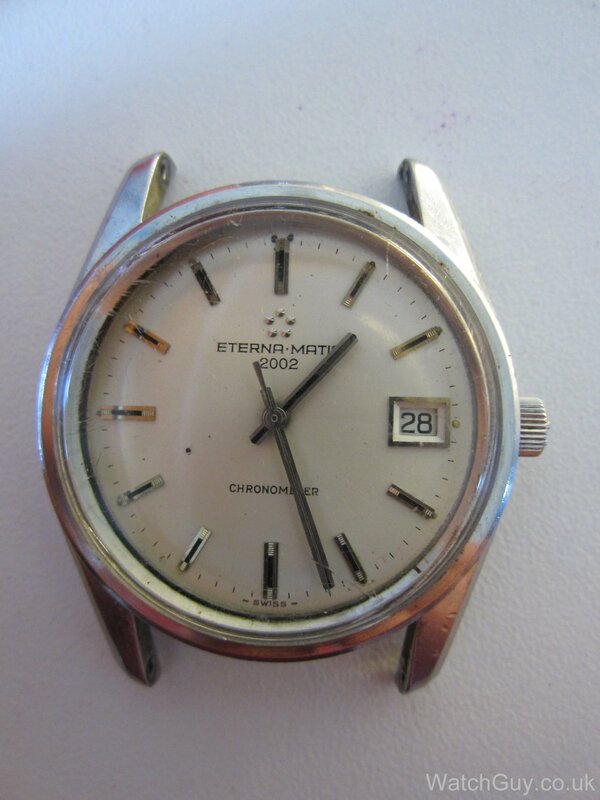 This watch was dated 1974. Do a Google search on ALCAN and Eternamatic to see some more of these. 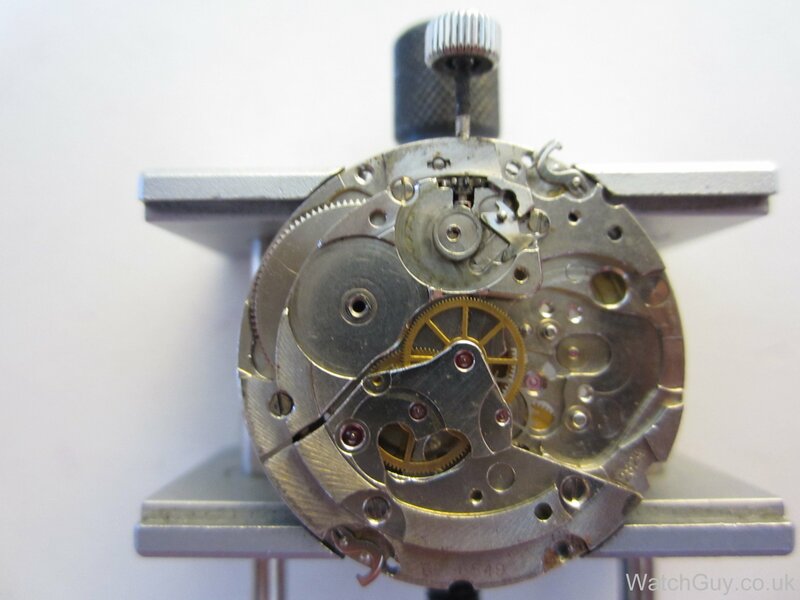 There is a distinction between “Certified Chronometers” and just Chronometers. 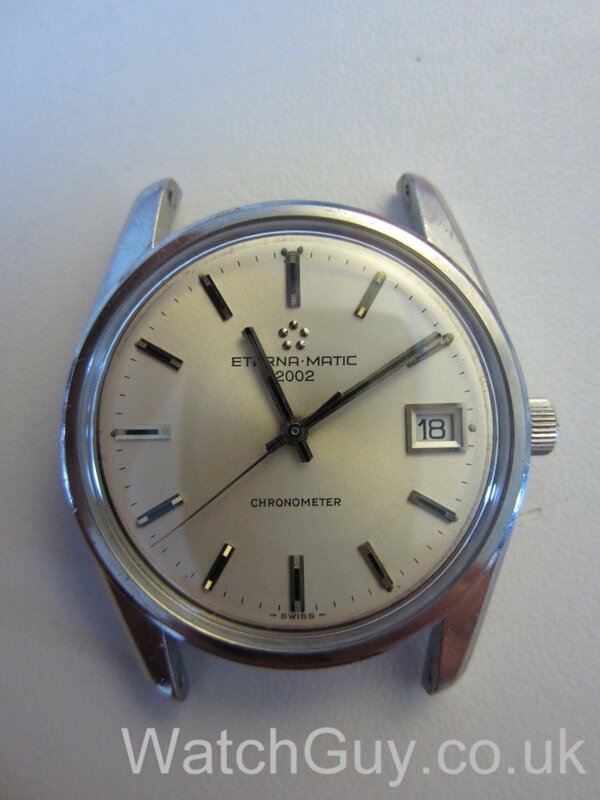 It appears that makers, like Eterna, was able to sell watches as Chronometers without having them presented for certification at COSC or equivalent. 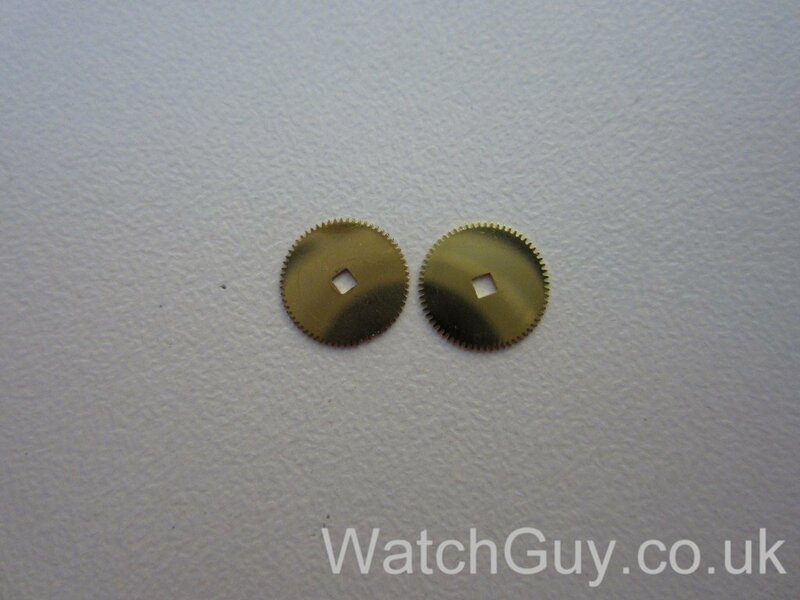 This simply then meant that you had to take the manufacturers word that it had been specially prepared and adjusted. This watch I believe is 100% authentic in this respect. The movement for this watch is stamped with its own serial number, however the COSC standard “Adjusted to…” print is not there. This is to be expected from Eterna from this period. Thank you for sharing this information with us, Anders. I contacted Eterna after your post, and they are actually replying in a very helpful way! Just love Eterna watches.. Elegant nice design! 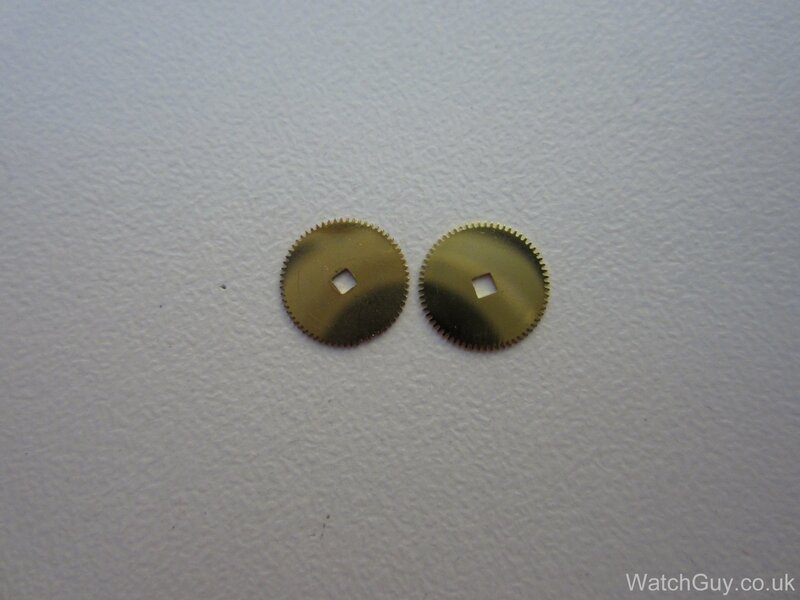 Looks like another great job completed, and as always your blog is a good read!